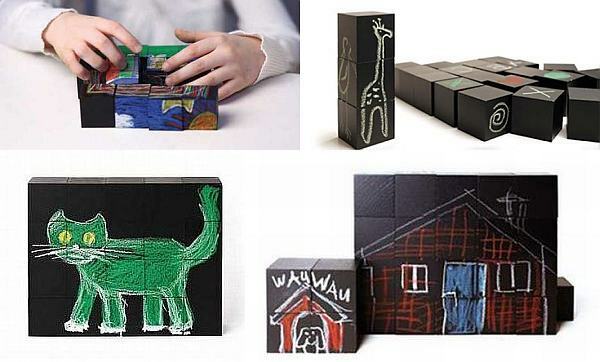 Naef’s Colorem are sets of maple wood cubes covered in blackboard paint that can be coloured in and built into whatever your child desires. Such a simple idea but so brilliant! Choose from twenty-five or twelve pieces, each kit comes complete with five chalk crayons and a sponge to easily wipe away artwork and start over. Great as building blocks, kids can make their own puzzles or memory games plus there’s no paper involved so less mess and more environmentally friendly. We’ve featured Swiss toymaker Naef’s great products before on Babyology – check out this ingenious musical instrument and this great wooden toy. Colerem cubes are US$59.99 for twelve, or US$99.44 for twenty-five, plus shipping costs, available direct from Naef.